Flying over French Polynesia is a wonderful introduction to the spectacular topography of the region. The atolls of the Tuomotu group, sprinkled in the ocean and donut shaped fall away to the rugged and wild look of the Marquesas – green and fertile squatting in the Pacific. Somewhere below and not far away is Miss Tiggy completing her long trek! As it turned out we were reunited the next day – a relaxed, relieved crew enjoying a beverage at anchor was how I found them. A couple of nights at the Hannakee Pearl Lodge on Hiva Oa, was enough for James (who couldn’t sleep without the rocking and rolling of the boat and who found the rooster crowing at 3am just too much to take). With the departure of Lloyd and Sarah who were brilliant crew and company for the long passage, Miss T is now back to just 3 – James and I and our girl wonder, Rachel. Time now for exploration of the Marquesas! Apart from the tepid blue waters, palm trees and white sandy beaches what has made this remote region of the South Pacific so special to us, has been the community spirit and open and friendly welcome we have received here. The principal language is French but Marquesan is bandied around by the locals. The school girl French has been heaved out of the past – you would think after 12 years in Europe it would be better than that. Luckily we have some linguists on the rally!! 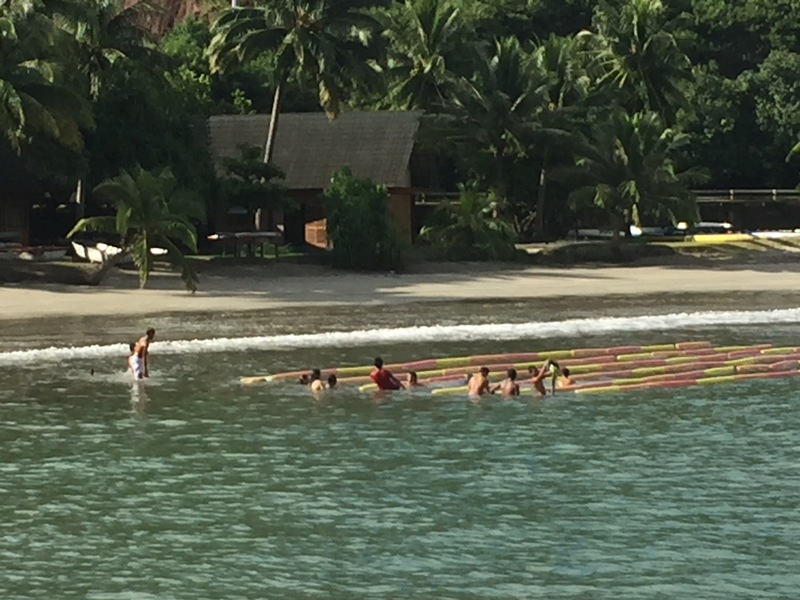 Life on the islands is like anywhere else…the kids go to school every day and we witnessed swimming races in the bay with lane ropes set up just like a regular Phys Ed lesson or school swimming club. Nicky, one of our lovely English friends and a teacher by trade, went and spoke to a class of primary students on Hiva Oa – what a treat for them! The shops shut at midday and reopen at 2 or 3pm after lunch and the internet is available sporadically. It is not without frustrations however. Lloyd left us to fly to Nuku Hiva with the intention of staying for 2 nights and then on to Papeete before returning to Australia. He went to the airport to catch his flight only to find it was cancelled and so returned to the Hannakee Pearl Lodge with no information about why it had happened and with no idea of when he would fly out. Long story short, he lost 2 days trying to get to Papeete. The rainfall in the islands has been very high for the past few weeks so there is little or no fresh salad or vegetables to be found and none expected to be delivered while we are here via the infrequent ferry services from Tahiti. The baguettes are amazing if you get up early enough to track one down – we watched on in one village where the baker had to throw out all his dough because his bread oven had broken down, much to the obvious disappointment and frustration of the local population….there are some very obvious French traits alive and well here. A special celebration was held for the Oyster Rally at the local community centre where we were welcomed by the Mayor of Nuku Hiva and treated to an evening of dance, traditional dishes and the usual overindulgence of beer and wine. Locals and yachties alike were dancing together by the end of the evening. Needless to say, it is not like you jump into a car or taxi to get home! Instead of a car park, a large contingent of tenders all vying for position along the dock added to a few too many beverages and a sizeable swell makes for interesting sights when boarding the dinghy! In a few days we will begin our next passage to Tahaiti via the Tuomotus Islands but for now there will be some serious exploration of Nuku Hiva and continuous onboard jobs to complete.